The Gold Coast Suns have continued their off-season recruitment drive by securing the services of West Coast Eagles midfielder Matt Rosa. The 28-year old joins the Suns after having played 168 matches for the Eagles, and made 17 appearances in 2015, including September’s Grand Final loss to Hawthorn. In return for the West Coast midfielder the Suns have given the Eagles draft selection 31 at next months national AFL draft. Rosa, who is currently holidaying with his family in Hawaii admitted he was delighted to join the Suns. “I’m rapt to be joining the Gold Coast Suns,” Rosa said. Rosa departs the West Coast Eagles with a message of thanks to the club he made his debut at in 2005. “I really want to thank and acknowledge everyone at the West Coast Eagles,” Rosa said. 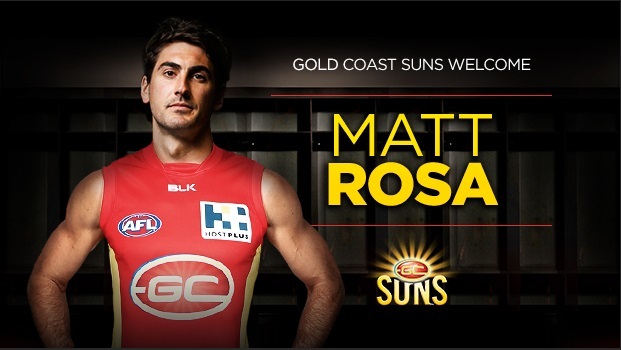 General Manager at the Gold Coast Suns Marcus Ashcroft said the club was pleased to secure the services of Rosa. “We are delighted that Matt will join our club,” Mr Ashcroft said. Ashcroft admitted the discussions with Rosa and his manager went smoothly during the trade period. “The club had been in discussions with Matt, his manager Alex McDonald and the West Coast Eagles throughout the exchange period and this has led to the smooth and trouble free trade being agreed upon,” he said.